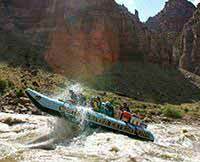 Colorado River Running at it’s best! It was in English--greatly appreciated. The reservationist was very helpful. Answered all my questions, encouraged me and did NOT rush me. EXCELLENT! I don't get to say that very often these days. Cort and the team in the store made sure I was prepared for my adventure. There was a young man in the store with glasses who was great and I am sorry I don't recall his name...he literally walked me around the store helping me. And the young pregnant woman was great and remembered me, she encouraged and shared her experiences. 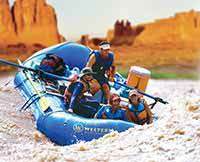 You have a wonderful team in the Moab Adventure Center. Eric is Phenomenal! He is charming, warm, knowledgeable and attentive to his passengers. He sharing of information about the rock formations and past experiences really added value to the trip. And he even cooks...if you know where a gal can find other men like this please let me know. Eric is a great captain--if I ever decide to get married again...I will look him up to do the deed! I hate to say perfect but it's the only word which fits. Jeff, Mie and I discussed what we would have changed about our trip and there was only one thing the velocity of the wind. Meegan was a perfect First Mate and a wonderful addition to our experience and you already know what I think about Eric...Fantastic Team and Trip Experience!